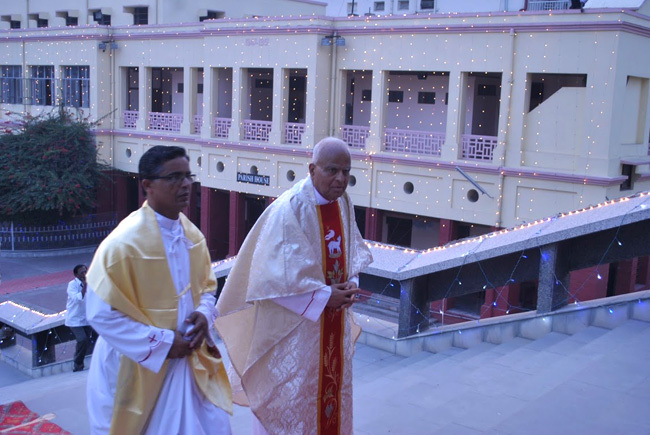 Udupi, 13 Dec 2015: On 7th November 2015, St. Joseph’s Cathedral, Lucknow was lit beautifully along with the neighbouring building’s in it compound which included the Cathedral School, Bishop’s house and the Parish centre on the Eve of the Golden Jubilee Celebrations of Four of its now retired Priests who would be completing 50 Years of Priestly Ordination on 8th November. 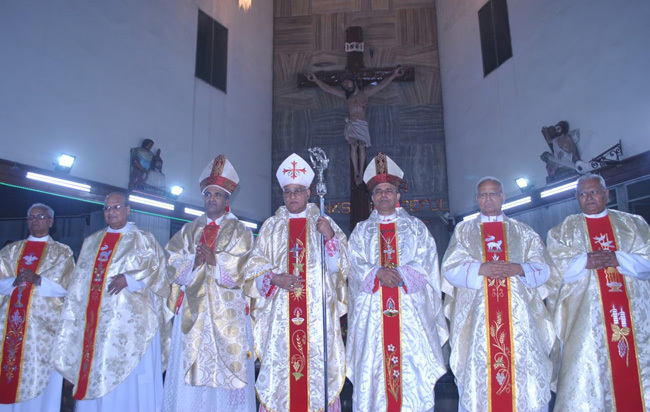 The Four Jublinarian’s; Monsignor Matthew D’Souza, Rev.Fr.Ignatius Martis, Rev.Fr. 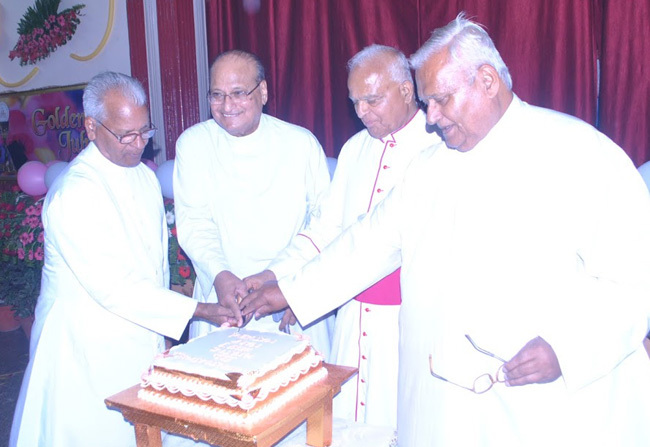 Mark Pinto and Rev.Fr.Henry D’Almeida were Ordained on 21st December 1965 have been serving the Lucknow Diocese in different Capacities for the past 50 years and have now retired to the Clergy House in Lucknow. 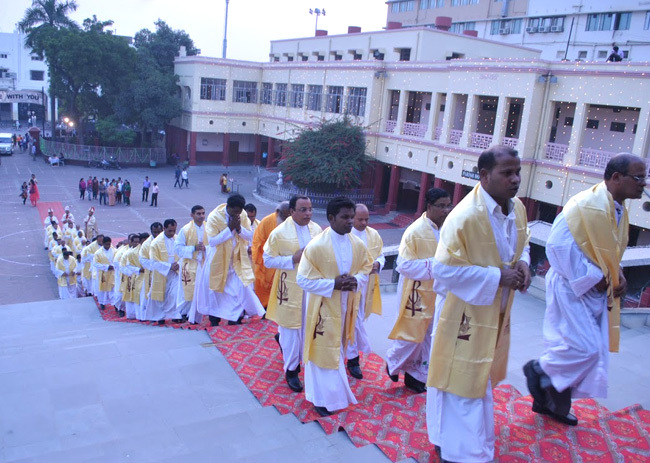 The Event began with the High Mass at St. Josephs Cathedral at 5pm which was attended by over 200 Priest’s, Nun’s and other Seminarian’s belonging to the Lucknow Diocese along with the Parishioner’s and nearly 50 relatives and Guests of the Jublinarians. 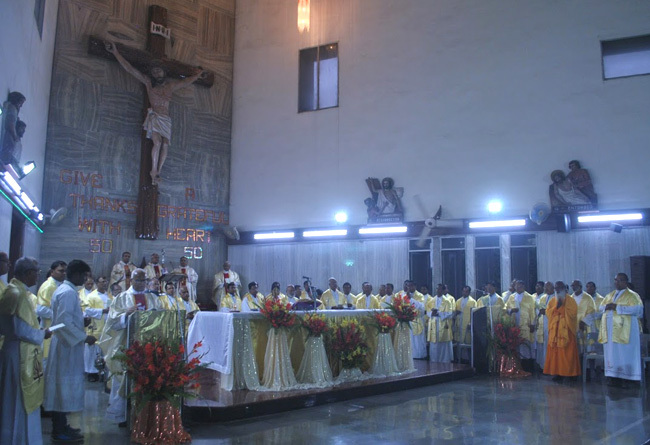 The Mass was Co-Celebrated by His Excellency Archbishop Albert D’Souza of the Archdiocese of Agra, His Excellency Bishop Gerald John Mathias of Lucknow and His Excellency Bishop Ignatius D’ Souza of Bareilly. 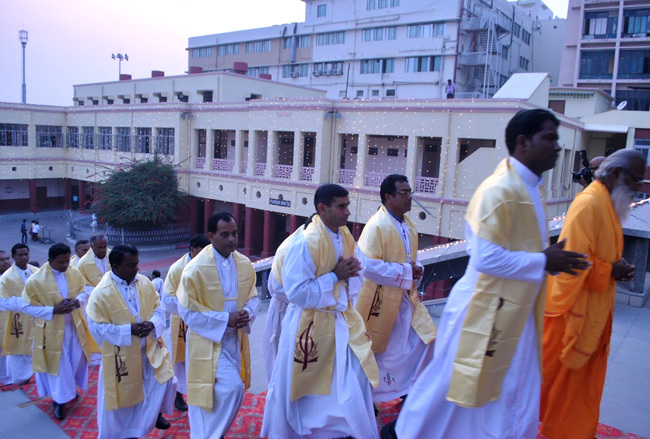 The Mass began procession starting from the Parish House to the Cathedral Altar of the entire Priest’s followed by the Jublinarians preceding the Bishop’s and Archbishop with the Choir Singing the Entrance Hymn Melodiously. 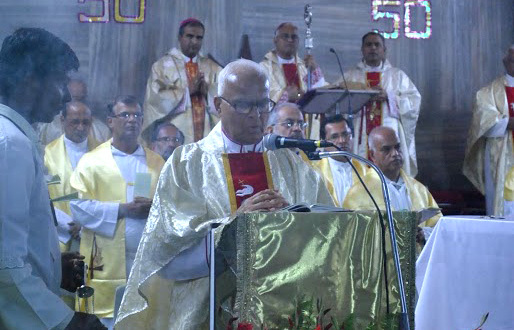 Monsignor Matthew D’Souza read the Gospel followed by a Charismatic Sermon by his Excellency Bishop Ignatius D’souza of Bareilly citing the Jublinarians as Inspiration to all the Seminarians and the Laity members of the Church. 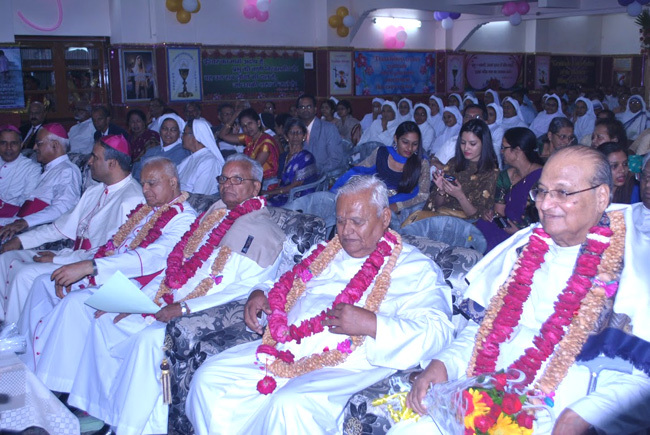 Following the Mass the Celebration Continued with a Cultural Program organized in the Parish House Hall with the Cake Cutting Ceremony followed by the Felicitation garlands and Shawls of the Jublinarians by their Excellency’s. 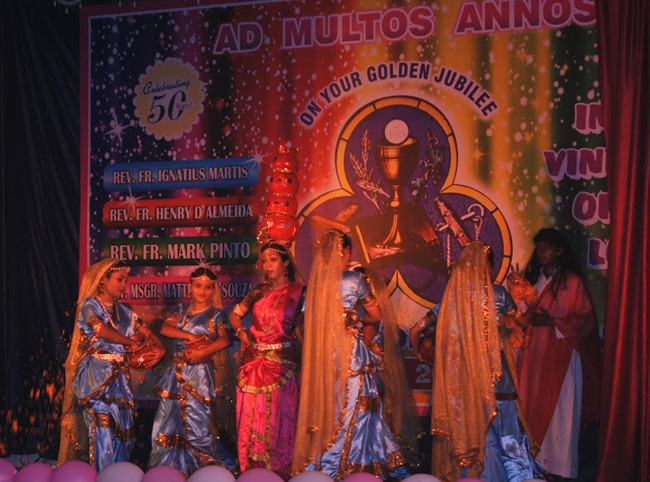 The Event continued with a Prayer Dance performance followed by Speeches by First His Excellency Archbishop Albert D’Souza of Agra followed by His Excellency Bishop Gerald John Mathias of Lucknow. 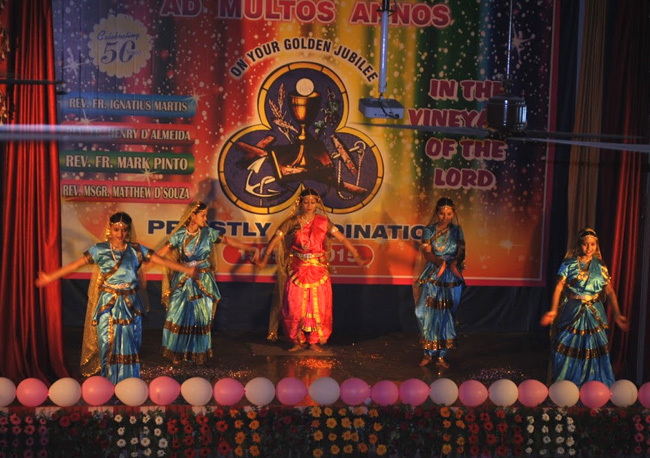 A 10 minute slideshow detailing the Life and Appointments of the Jublinarian’s prepared by the diocese was presented to the attendees followed by another Dance performance which was followed by a warm Thank you Speech by Rev.Fr.Ignatius Martis, after which relatives of the Jublinarians felicitated all the Jublinarians with a Bouquet of Flowers. 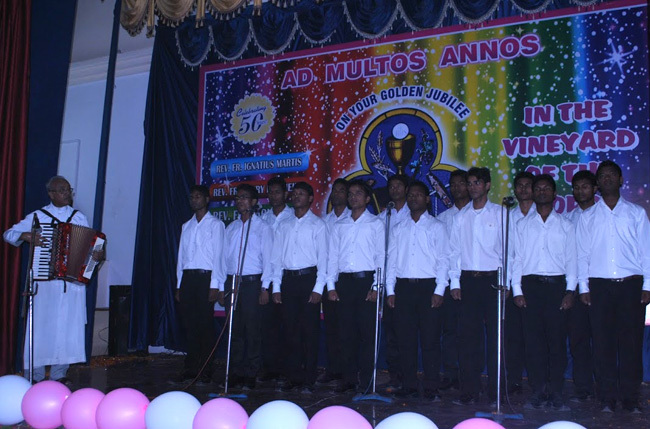 The Cultural Program Ended with the Seminarians Guided by Rev.Fr.Donald D’Souza singing the Papal Anthem. 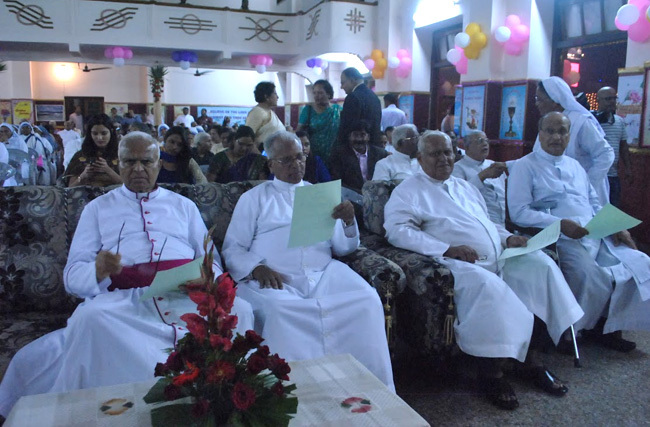 The Event ended with a delicious and aromatic Dinner for the entire Clergy and relative’s and guest’s organized on the Grounds of St. Francis College. Msgr. Mathew DSouza was born on 9th June 1935 at Kattingere, Moodubelle Parish as a 5th child of Emmanual (Monnu Master) & Magdalene DSouza. He was baptised on 21st June 1935 At St. Lawrence Church Moodubelle, Fr. Hugo Faustin Alva (Robert Alva’s Brother) was the God father and no God Mother. Minister of Baptism was Fr. 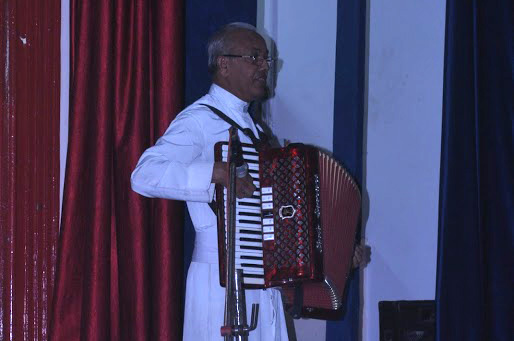 Willium Lewis who was later Vicar General of Mangalore Diocese. His primary schooling was in St. Lawrence Higher Primary School Moodubelle and High School at Hindu High School, Shirva. 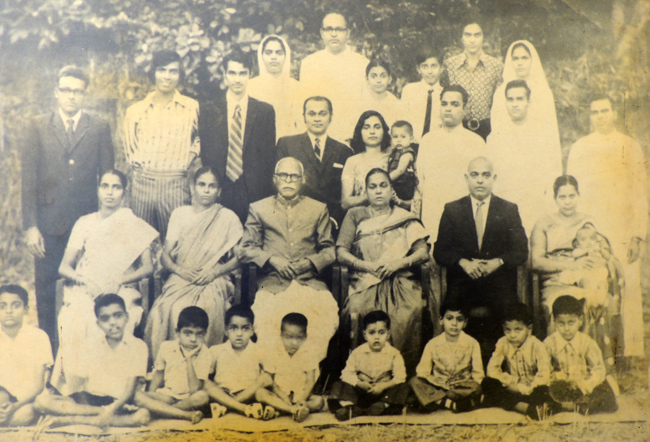 Joined St. Paul Minor Seminary, Lucknow (1965-68). 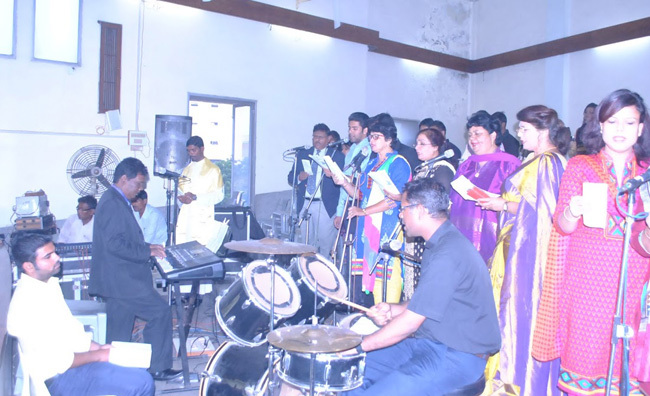 Major seminary -3 years philosophy followed by 4 years theology at St. Josephs Seminary Allahabad. 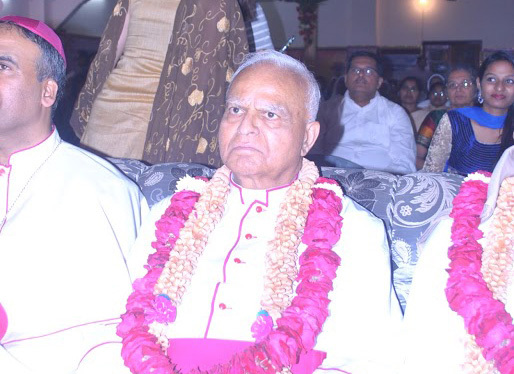 Ordained as priest on 21st December 1965 for Diocese of Lucknow, by Most Rev Raymond D’Mellow, Bishop of Allahabad. 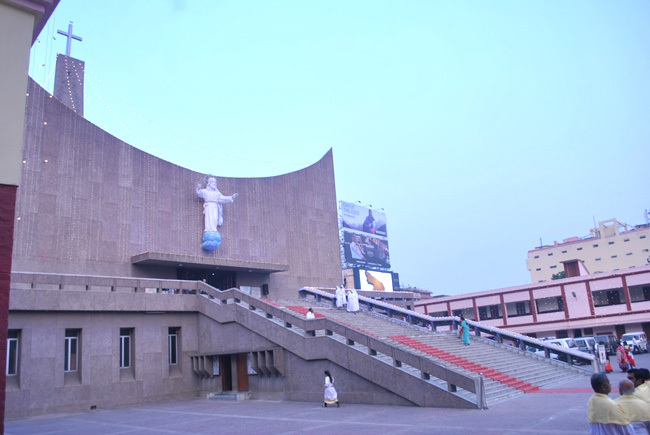 Worked as Astt Parish Priest at St. Josephs Cathedral (June 1996 to Jan 67). Studied BA at Karnataka University, Dharwar. 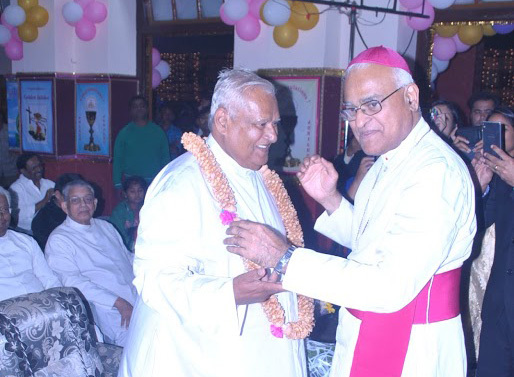 Parish Priest at Bana, Nainital (June 67 to 69), completed BA in the first year at Bana. 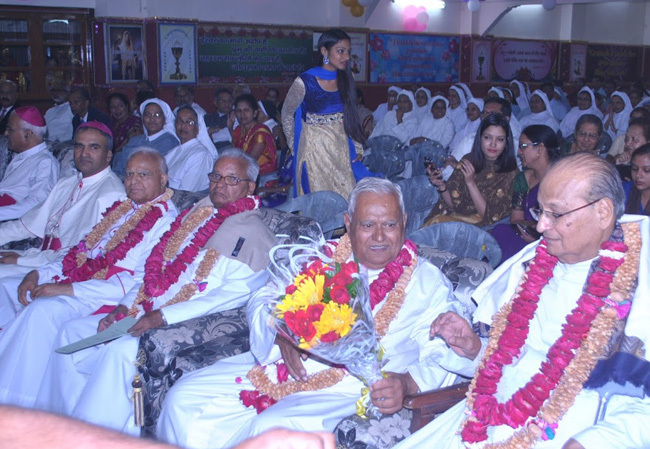 He became founding Parish Priest of Our Lady of Fathima at Gonda in 1969. 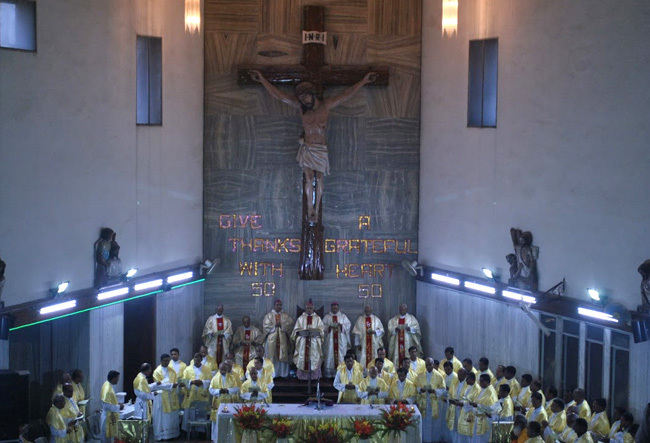 Parish Assistant at St. Theresa, Kathgodam January to April 1970. 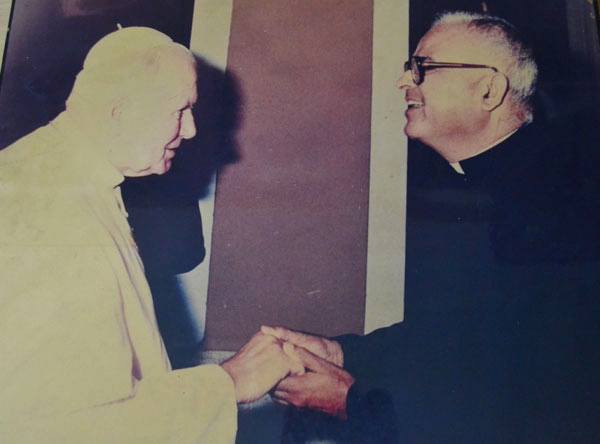 He was appointed as Parish Priest of Bovali from April 1970 to June 1975. He built the new Church and Parish Priest home over there. 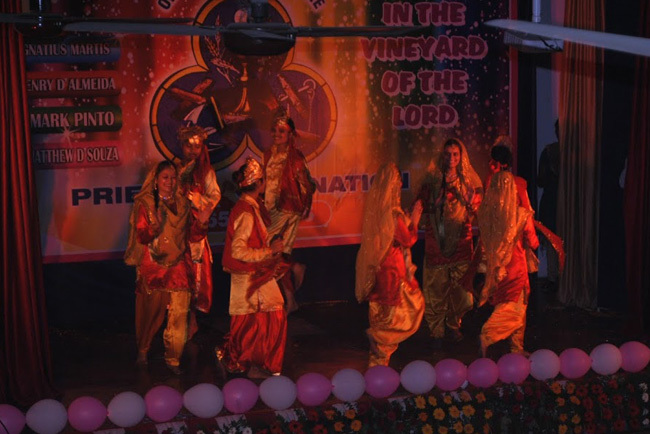 He acquired additional land in the city and planted over 500 various types of fruit trees with the aim of making Bovali Parish self sufficient. 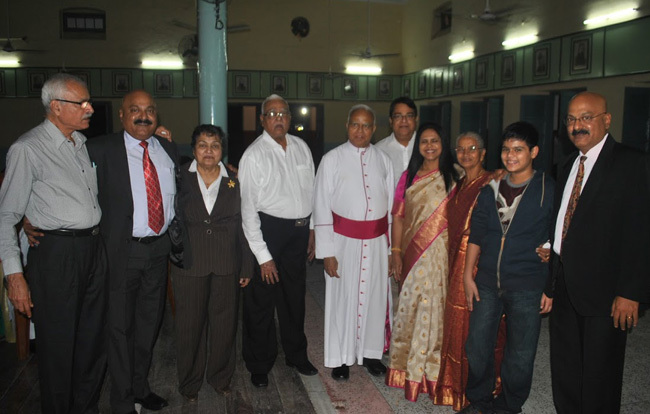 In 1975 Bishop Cecil of Lucknow approved him towards overseas assignment and he went to Costa Rica of Central America. He learned Spanish there since Spanish was the spoken language in most of Latin America. 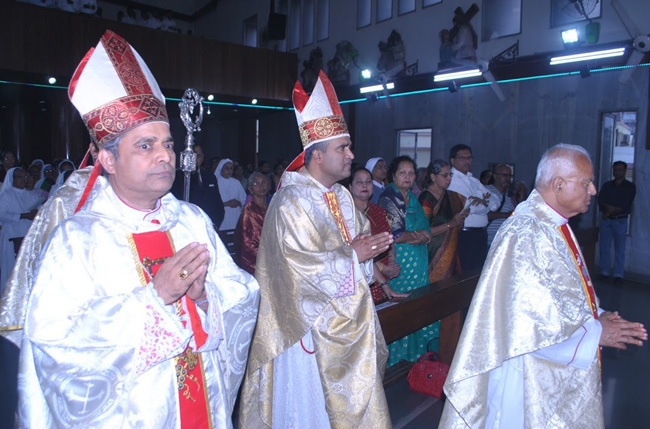 Bishop appointed him as Parish Priest of Nandayure. In 1978 he went to Jesuit University of Detroit to pursue master studies in Religious Education. While working in St. Precilla’s Parish in Livonia completed Masters with Honors in May 1979. 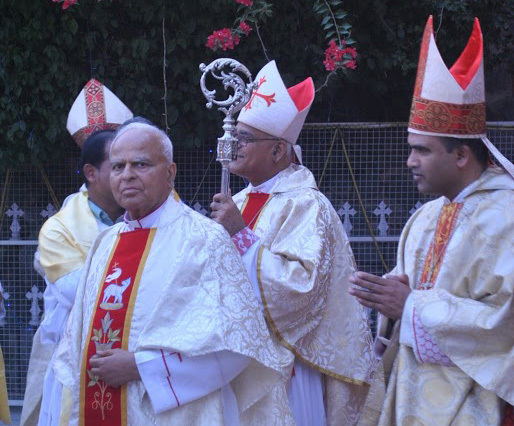 After the Masters he was deciding to go back to Lucknow, Bishop of Amarillo asked him to work for his diocese; Bishop himself contacted Bishop Cecil of Lucknow and got the permission. He was sent to St. Theresa Parish (Lubbock) in September 1980 followed by appointment as pastor of sacred Heart Petersburg and its mission of St. Isedore in Abernathy and remained there for three years. There he solved the problem of two communities efficiently, besides constructing priest’s house, a parish religious education centre and several other improvements. In 1983 Bishop of Lubbock requested him to take over responsibilities of larger Parish of Sacred Heart, Plainview, where there were problems due to priests arrest and to install moral and financial stability, where the strength of the parish was 12,000 people. Msgr. 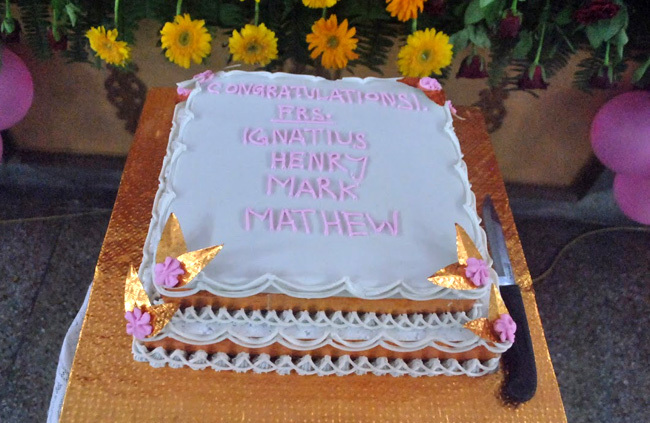 Mathew fixed all the problems in record time besides paying off all parish debts. He further built 10,000 Sq ft Religious Education centre and implemented several other projects that Parish badly needed. Though he was a priest belonging to Diocese of Lubbork, always his desire was to return to Lucknow. 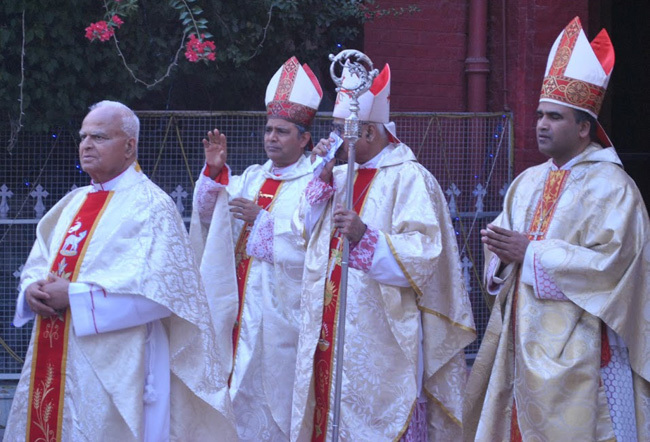 When his brother Albert became the Bishop of Lucknow, he thought it was opportune time to return. He started communicating in that direction. But Gods plan was different. 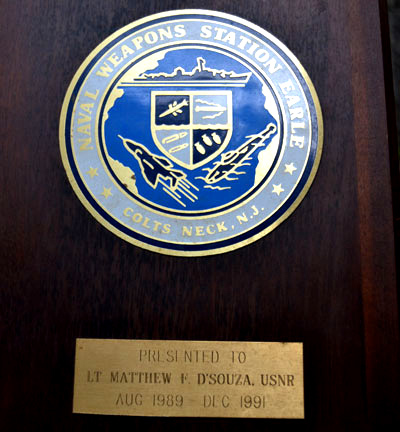 In July 1989 Rev Mathew was commissioned as US Naval Officer and became Chaplain of the US Navy. 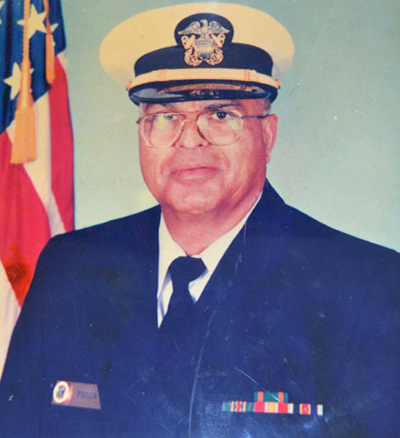 He served US Navy as a Catholic Chaplain until his retirement from active duty in August 2009. 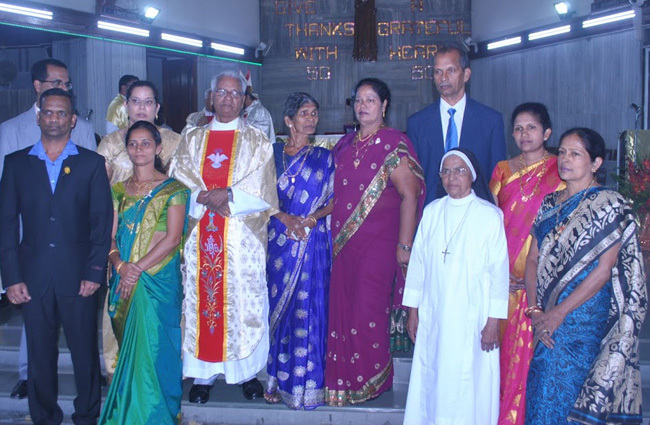 During his 20 years of Military life Msgr Mathew had quite a number of assignments in Naval Stations, Naval Air stations, Naval Medical Centres as well as short assignments to destroyer ship named as ‘USS San Jecinto’. One of his overseas assignments was to Japan to a Naval Medical Center, Okinawa. 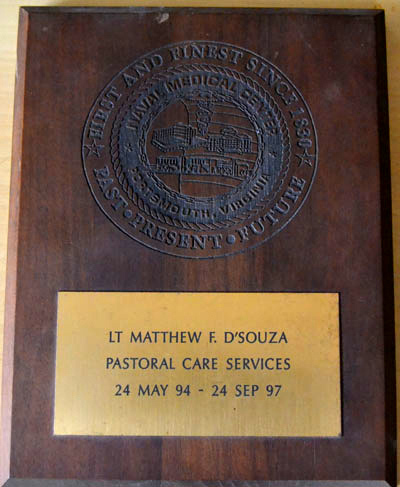 During 20 years of his military life, Msgr Mathew has been awarded numerous recognitions and awards including 2 US Navy Commendation Medals. He was also awarded Outstanding Service in the Health Care Ministry by the Arch Diocese of Washington DC. The award was presented by Cardinal Donald W. Wurel in March 2009 during Annual symposium. After completing 75 Years he retired from active Duty Navy, Msgr Mathew had plenty of opportunity to get involved in priestly duties in the Archdiocese of Washington DC, frequently commuting by Metro trains to the Shrine of Basilica of Immaculate Conception, NE DC to help there in the spiritual ministry, spending at least two hours in the confessional. 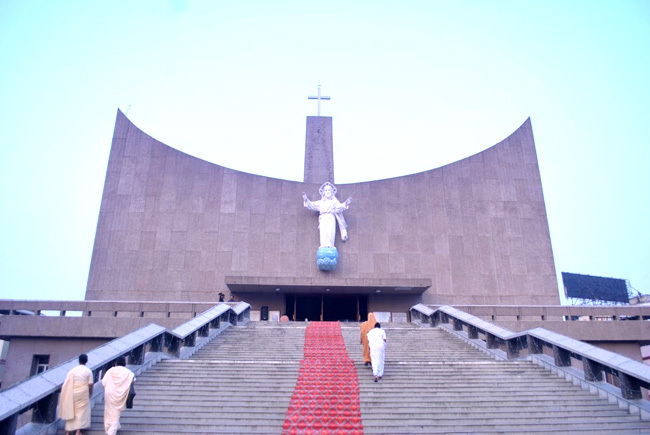 This being National Pilgrimage Centre, people from worldwide visit this centre. Last and may not be least in his life is the honour bestowed on him by His Holiness, Benedict XV1 on 19 Dec 2011 as Chaplain of His Holiness, declared him Monsignor. 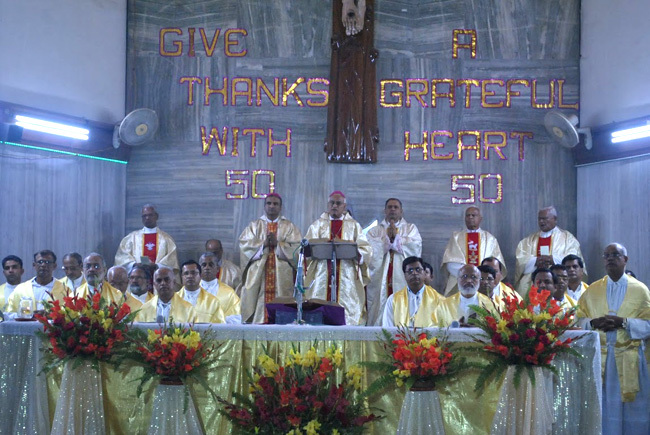 After spending 40 years in America in November this year he moved to Lucknow for good, celebrated 50th anniversary of Ordination, and very happy to spend time with the three more priests who were ordained with him. 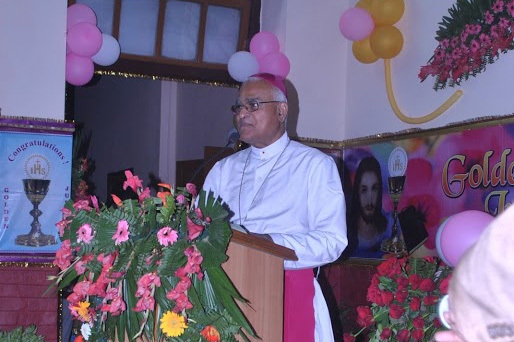 Bishop of Lucknow is very happy to have him back in his diocese. 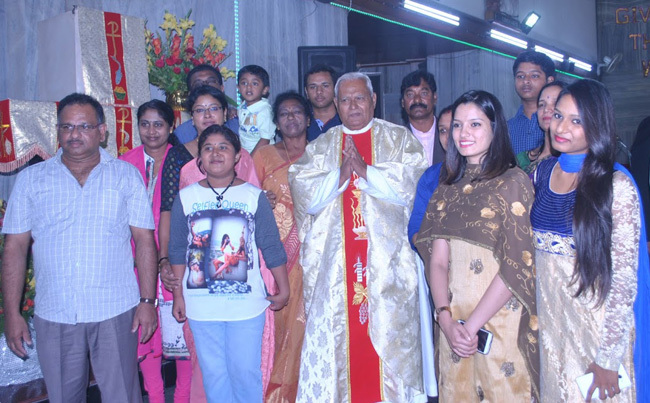 Monsignor Mathew DSouza always lived a simple, humble and life of poverty. He kept donating all his personal savings to build Churches, orphanages, religious training Centres, mission stations and seminarians expenses. 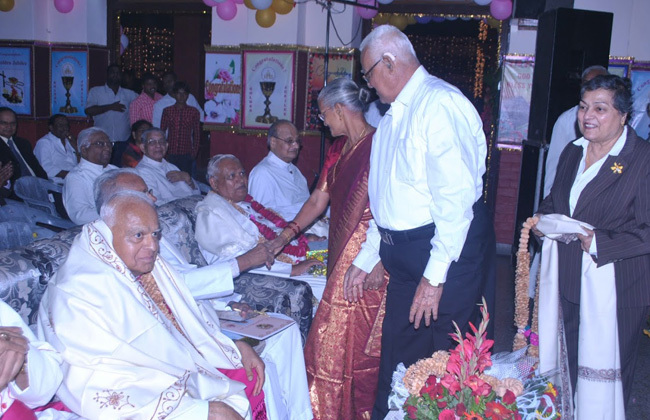 Though age is catching up, he is happy and contented in the service of God with his limited physical strength at the moment. 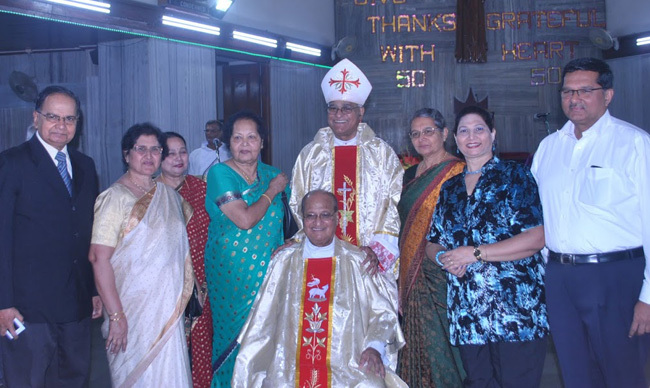 Long Live Monsignor Mathew F DSouza!!! 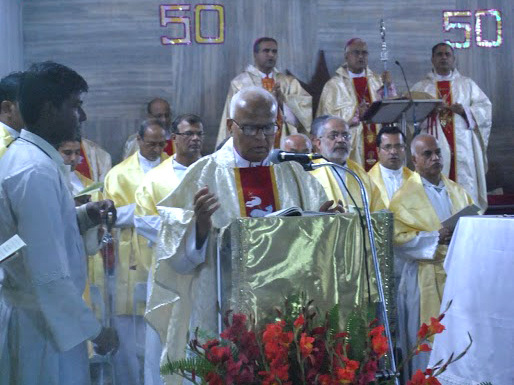 Congratulations Monsignor Mathew Dsouza. May God grant you many more years of health. You have done great work in those 50 years. A heart felt CONGRATS Msgr D Souza from your friends Mike and Beth Carr. 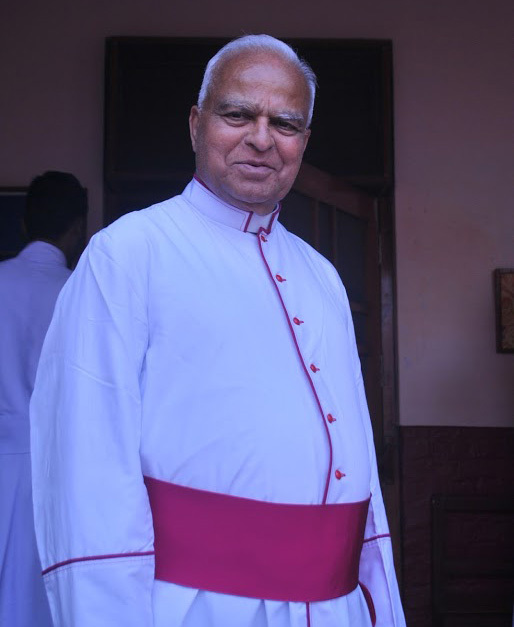 As student of late Monnu Master and class mate of Archbishop Albert I am extremely proud and delighted to learn about Golden Jubilee of ordinationn of Msgr Mathew DSouza of my native parish at Moodubelle and congratulate him and his entire family on this glorious occasion and wish them good health happiness always. Congratulations Msgr. 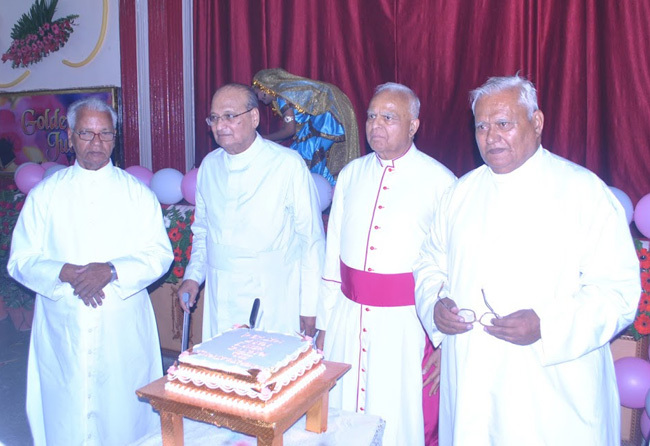 Mathew DSouza for having completed 50 years of priestly life. Almighty God bless you in good health. Thank you Lester for the article on dedicated service of Fr. Mathew. 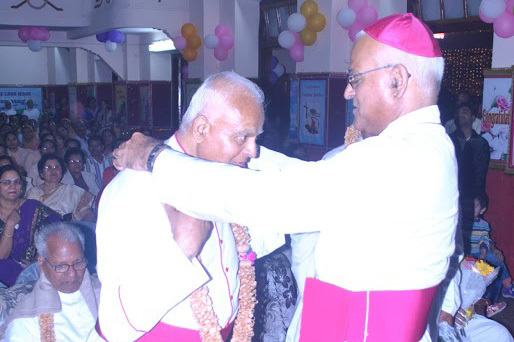 Impressed with his unique assignments and his dedication for the service of Lord and Christianity. Congratulations Msgr. 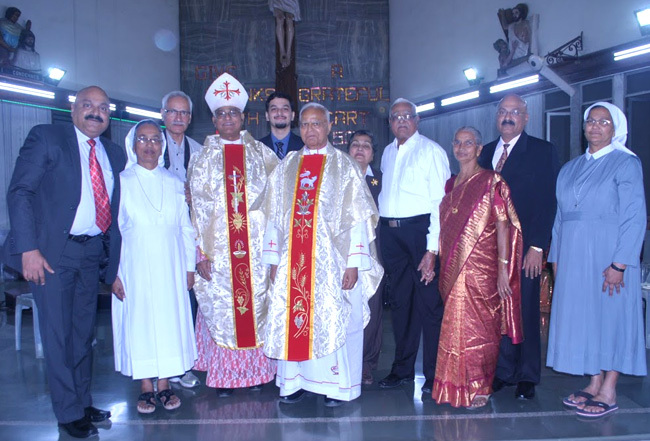 Mathew DSouza for having completed 50 years of priestly life, major part of which was spent as Chaplain in US Navy. 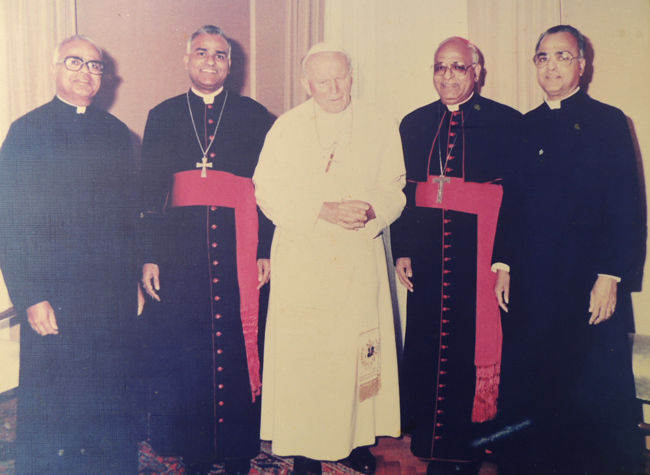 The brief account of Msgr. Mathew by his nephew Ronald Sabi is quite interesting. 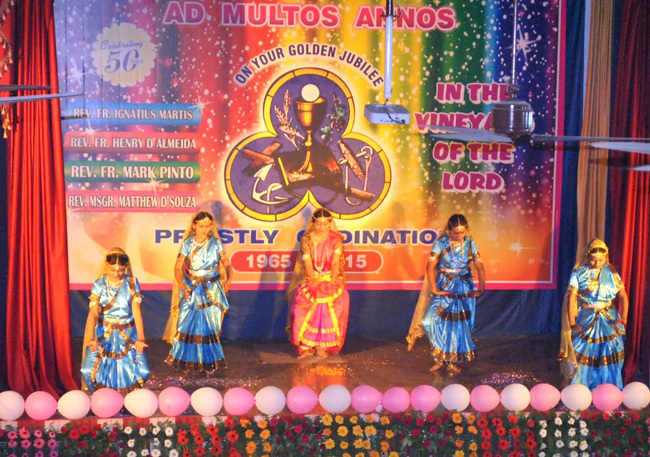 The list of archival articles manifests the contribution of the sons and daughter of late Immanuel (Monnu Master) DSouza of Kattingeri, Moodubelle to the church and society. 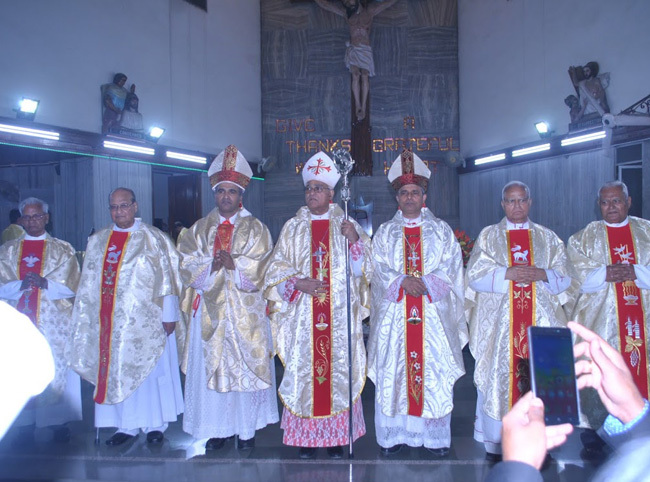 It is indeed a matter of great honour to the Mudartha family in which four sons and two daughters have been dedicated to the service of the church and society-Archbishop Albert DSouza(Archbishop of Agra), Bishop Alphonse DSouza(Bishop of Raiganj), Msgr. 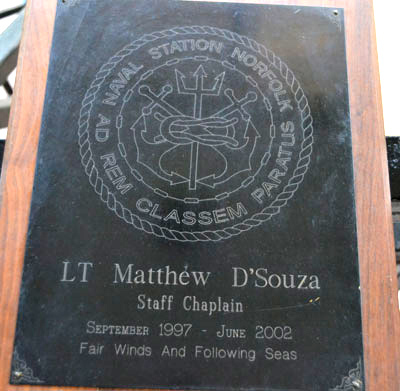 Mathew DSouza(Retired as Chaplain in US Navy), Fr. 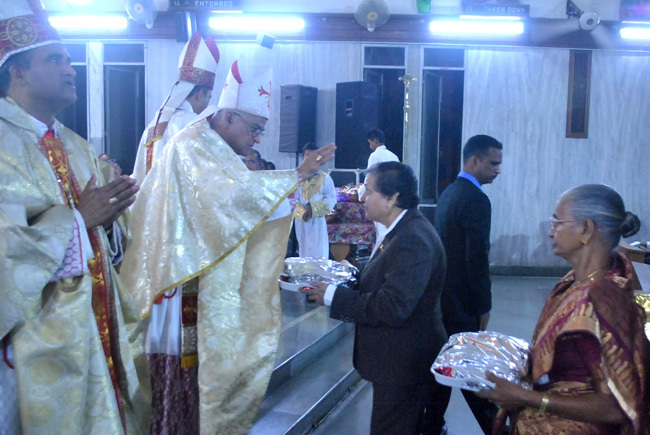 Edwin DSouza(Serving in Mississauga, Canada), Sr. Eugene DSouza(Superior General of Holy Cross Congregation) and late Sr. Lucy.